What does reclusive author Robert Pimm look like in the flesh? You can find out on Friday 15 June at the wonderful Shakespeare & Co bookshop at Sterngasse 2 in central Vienna. I will be reading from my new Berlin thriller “Blood Summit” (“a rip-roaring romp of a thriller” – Sir Christopher Mallaby). Entry is free and copies of the book will be on sale. Come along – and bring a friend! For a preview, see the video below, from my March 16 reading at Cafe Korb, also in Vienna. Let me know if you have any questions about how to attend. If you don’t live in Vienna, maybe this is the excuse you have been waiting for to book that lovely weekend in the beautiful Viennese capital, with entertainment on Friday night already fixed up. If you would like to buy or read Blood Summit, click here. 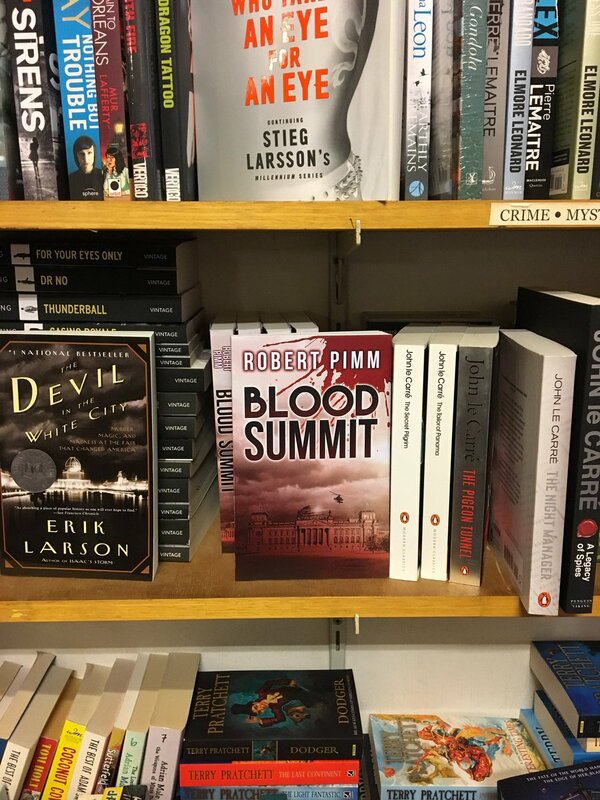 By Robert Pimm in Fiction: Blood Summit, Robert Pimm, Writing: about writing on 09/06/2018 .